Bowens Mount. Bowens mount adds most studio flash accessories, e.g. softbox, reflector, beauty dish, etc. 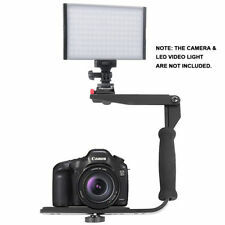 Unique speedlite mounting way: mounted horizontally or vertically by wrapping speedlite body. Included: 1 x Hot Shoe Mount Adapter. Three hot shoe outlets are set up to allow you to add various devices at will, such as microphones, fill light, and small devices. Due to the different display and different light, the picture may not show the actual color of the item. Swivel Triple Hot Shoe Mount Adapter Flash Light Stand Umbrella Holder Bracket Package Included: 1 x Tri-Hot Shoe Flash/Umbrella Mount Adapter Description: This flash mount bracket is designed with 3 independent adjustable hot shoes and 2 umbrella holding Holes. 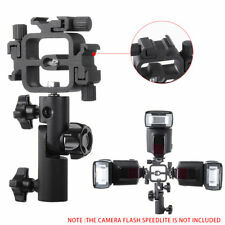 It is useful for you to connect the tripod with flash light and soft umbrella, which helps you to get an optimum angle for great photographic results. MATERIAL: Made of HIGH QUALITY Durable and solid Plastic and Aluminum.Your reflective umbrella can be firmly supported by LEOFIT Swivel Light Stand Bracket B type bracket. FEATURES: EASILY to amout a hot shoe flash slave sensor reciever using the hot shoe flash mount.You may also adjust the umbrella and flash in different angle. Bowens mount design facilitates most studio flash accessories, such as softboxes, reflectors, beauty dishes and so on. Softbox (Bowens mount supported). Beauty dish (Bowens mount supported). BOWEN MOUNT DESIGN AND FURTHER SUPPORT: Bowens mount design facilitates most studio flash accessories, such as softboxes, reflectors, beauty dishes and so on; Umbrella input hole included as further support to your studio practices and lighting direction is adjustable via handle support. Custom Brackets QRS-E2 Rotational Camera Bracket & Off Camera Flash Mount. Condition is Used. Shipped with USPS Retail Ground. Neewer® 2 Pieces S-Type Bracket Holder with Bowens Mount for Speedlite Flash Snoot Softbox Beauty dish Reflector Umbrella. 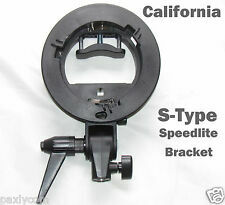 Here presents NEW-STYLE NEEWER S TYPE Speedlite Mount Bracket to facilitate your shooting/filming! FEATURES: FASTEN to any standard light stand EASILY and TIGHTLY. Accommodates any standard umbrella via umbrella mount and holds light in place. Item Weight: 10.6 ounces. MORE INFORMATION. Or unwanted shadows. 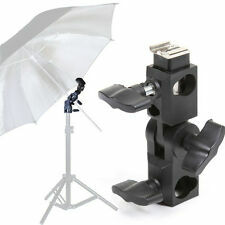 1x L-Shape Flash Bracket Hot Shoe Mount. Quick Flip Design. Light Weight & compact. Suitable for all DV With a standard 1/4" mount. US Continent lower 48 states:FREE! No local pick up. The swivel light stand bracket is an ideal accessory for shooting on the run. M H Type Swivel Flash Umbrella Bracket Holder 1/4"3/8"Screw Adapter for Tripod Monopod Light Stand. 1 x flash bracket H Type. The thumbscrew features a 1/4" stud on top and a 1/4" female thread underneath. Silicon Rubber Grip. Features a silicon rubber grip handle. 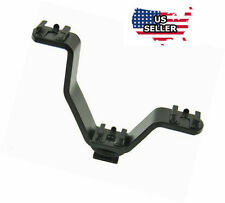 The bracket is 4.5" wide, 5" in height, and is compatible with most camcorders and DSLRs. 1x dual hot shoe mount. Rotatable construction allows to flexibly position the video light to fill light. Color: Black. 100% brand new and high quality The main body made of metal materials, affixed with non-slip rubber pad Designed with 1/4'' screw hole, and comes with 2 pieces of 1/4'' adapter screws Can support 2 cameras or flash units by hot shoe mount adapter at the same time You will receive one Flash Bracket 2pcs of adapter screws. It doesn't comes with any Flashes or Cameras or hot shoe mount adapter Compatible with dslr cameras & flash speedlight brackets Material Aluminum alloy&rubber Color Balck Length 265mm Thread 1/4” Max load rating 3kg To Fit Camera Manufacturer warranty 3 months Country/Region of Manufacture Hong Kong Brand Unbranded/Generic MPN ED702921763988 UPC 702921763988 Brand Unbranded/Generic MPN ED702921763988. Material:Aluminium Alloy. pave the way for more dynamic effects, doing what traditional single hot shoe can't do! Furthermore, it has a threaded hole for. A 1/4"-20 threaded hole for mounting it on tripod or light stand!Note: Bracket Only! The flash bracket accepts a mount type flash and has a tripod socket. It can be mounted onto hot shoe / cold shoe mount. 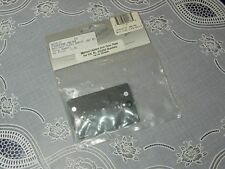 ( There is a 1/4" hole size in bottom of the adapter, may you can use it from that part). On a tripod, and a 1/4"-20 male screw with a shoe on top to attach a flash, video light, microphone. Contents - 2 Bracket Shoe Mount Adapter. or any other shoe mount accessory. Credit will be issued upon receipt of product. Sometimes it's necessary for video camera to use more LED lights for effects enhancement, but normally one camcorder has only one hot shoe. With this Hot Shoe Extension, you can have more lights used with one cam, simply insert the item to the hot shoe position, and then put the LED lights in. Mini and featherweight, easy to carry. 1 x Triple Hot Shoe Mount Adapter. With a detachable rotary connector, making the accessory mounted on the adapter can freely rotate in 360 degrees. Load Bearing: Max. On a tripod, and a 1/4"-20 male screw with a shoe on top to attach a flash, video light, microphone. Contents - 4 Bracket Shoe Mount Adapter. or any other shoe mount accessory. Credit will be issued upon receipt of product. Neewer Professional Universal E-Type and S-Type Bracket Holder with Bowens Mount for Speedlite Flash Snoot Softbox Beauty Dish Reflector Umbrella Photo Studio Accessories. Bowens mount design facilitates most studio flash accessories, such as softboxes, reflectors, beauty dishes and so on. 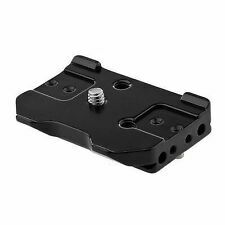 Selens SE-31 3-in-1 Flash Bracket Selling Point Below: - 1: cold shoe use the same design of the SLR camera, and the flash can mount on perfect than others. - 2: 1/4" screw on bottom make it fits most light stand or tripods. - 3: 120 degree form each cold shoe make the light more equality than the 90 degree one. - 4: a 1cm umbrella hole on the center for holding umbrella. - 5: a 3. Give us a chance to make things right for you, and we will do our best to provide a fitting solution. Product weight: 150g. A built-in umbrella hole in tri-hot shoe mount can auto-locks reflective or soft umbrella with reed. With an adjustable screw at the bottom hole to accept different light stand head. 1 x Tri-Hot Shoe Flash/Umbrella Mount Adapter. 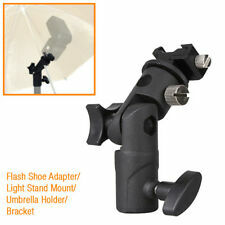 Hot Shoe holder with build in umbrella holder. 1 x Flash Hot Shoe Mount Adapter (without original box). Designed with cold foot, support standard hot shoe. 1/4” brass nut in the bottom, suitable for light stands or flash holders with 1/4” screw head. Bowens mount design facilitates most studio flash accessories; Supports studio lights, flashes, umbrellas, softboxes, reflectors, beauty dishes, snoots. 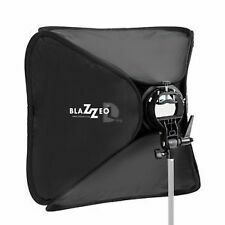 Bowens mount design facilitates most studio flash accessories; Supports studio lights, flashes, umbrellas, softboxes, reflectors, beauty dishes, snoots. Feature: With standard Cold Shoe, Suitable for most flashes, such as Canon, Nikon, YONGNUO, Godox or other accessories with hotshoe mount, etc. BUT it is NOT suitable for Sony flash! It has a Standard 1/4 threaded hole at the bottom, which can directly attach to tripod or other accessories with 1/4 screw. Make of aluminum alloy, more durable and tight Bayonet 100% brand new and high quality Color: black (the threaded hole is sliver color) Package Includes: 1 x Cold Shoe Adapter. 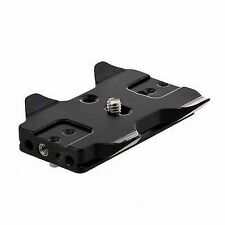 A flash bracket fits into a shoe mount and provides multiple, similar mounts for accessories. With video and audio recording functionality, a camera flash bracket often needs to do more than just hold a flash. A bracket can allow you to mount accessories like microphones and video lighting that may need to find a spot on your camera. 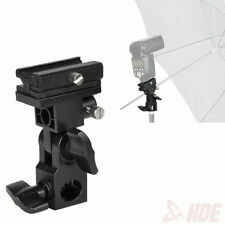 What types of accessories go on a camera flash bracket? What types of camera brackets are there? There are many varieties of brackets. The V-shape design has mounts extending up and away from the shoe. V-shape brackets are useful for mounting lighting and a microphone to shoot video. Place the flash in the position closest to the camera. A flat bracket extends to the left and right of the shoe. This is useful if you are using dual flash for photos. A swivel or gimbal bracket adjusts the position and angle of the mount. You can use a swivel on another bracket for increased flexibility if you have a cumbersome accessory in your kit. 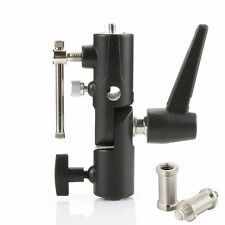 A handle mount incorporates a handle into it for better grip of your camera. Will a bracket trip a flash, or several? Some will. You will need to be sure you are getting a hot shoe device if you need to trip a single flash or multiple flashes. Most are cold shoe brackets and will not trip a flash. If you have a cold shoe bracket you may be able to trip your flash using a plug into the camera, or by a sync device. However, many of the devices you may attach, like a microphone or light reflector, do not require a hot connection. Where's the best place to put the flash? It is generally best to keep the flash as close to the lens and centered as possible unless you are using multiple flashes. If the light source is too far away from the lens, there will be a noticeable shadow in captured images. If you are using multiple flashes, be sure to spread them along the front of your scene evenly to avoid shadows. How much weight can the shoe support? The shoe should be able to support multiple devices that are designed to be mounted in a shoe. If you see any sagging or wiggling, you should reduce the weight.